After completing his daily shift as a public-school cafeteria worker, D.A. took some of the leftover food from his job to his friend’s home. On the night of D.A.’s accident he had stopped by his friend’s home in an apartment building to pick up his Tupperware. Unfortunately, D.A.’s friend was not home. On D.A.’s way down the apartment building stairs from his friend’s home the left jacket sleeve cuff on D.A.’s arm caught onto a protruding stairwell railing which caused D.A. to lose his balance and fall down the stairs. Because of the fall down the stairs D.A. injured his right wrist. K.K., a young mother of two children who recently moved here from the Ukraine, was injured when the drain cover in the basement of the apartment building she lived in slid from its normal placement. While K.K had been returning to her apartment from the laundry area of her apartment building when she stepped on the defective drain cover. The drain cover slid from the hole it covered causing K.K.’s foot to fall into the hole. K.K. went to the hospital and was informed she had torn a ligament. 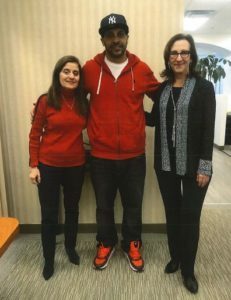 Posted in Our Clients Speak | Comments Off on A Ukrainian Woman Receives $383,000 Settlement for Leg Injury Thanks to Hill & Moin. D.H., originally from Jamaica, a self-employed driver and technician transporting and repairing various medical supplies, was injured while out on one of his assigned jobs. After exiting the client’s building, D.H. slipped and fell on a clear patch of ice on the sidewalk. The trip and fall resulted in D.H. sustaining injuries to his shoulder, lower back and his elbow. 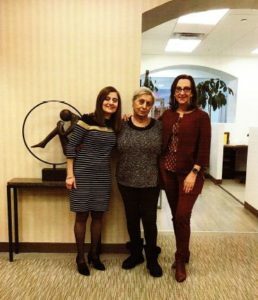 A.S., an Armenian woman who had been working as a home care attendant for over a decade, had just left one of her client’s homes and was on her way to her next client’s home on a wintery January morning. While walking there she noticed some ice had formed on the sidewalk. While attempting to avoid stepping on the ice, A.S tripped and fell on the unleveled concrete slab of the sidewalk. A.S.’s doctors informed her that she had torn her meniscus. Posted in Our Clients Speak | Comments Off on Dedicated Home Attendant with Knee Injury Receives a $500,000 Settlement After Falling on Sidewalk. While S.B., a Russian woman who worked as a personal home cleaner, was walking to a nearby store, she decided to take a short cut through the Naples Terrace Staircase. As she attempted to walk down the dimly lit exterior staircase, she tripped and fell down the stairs which directly resulted in her badly twisting and injuring her left ankle.